Hey, did you guys all notice the avatars that we put up yesterday? You can find them here or on the cast page. Feel free to use them, just be sure to tell everyone where you got the spiffy icon… or at the very least, take a look and smile with nostalgia at all the wacky faces. It’s like a scrapbook of The Fourth, or at least a collection of those awkward school photos where you’re always making a stupid face. 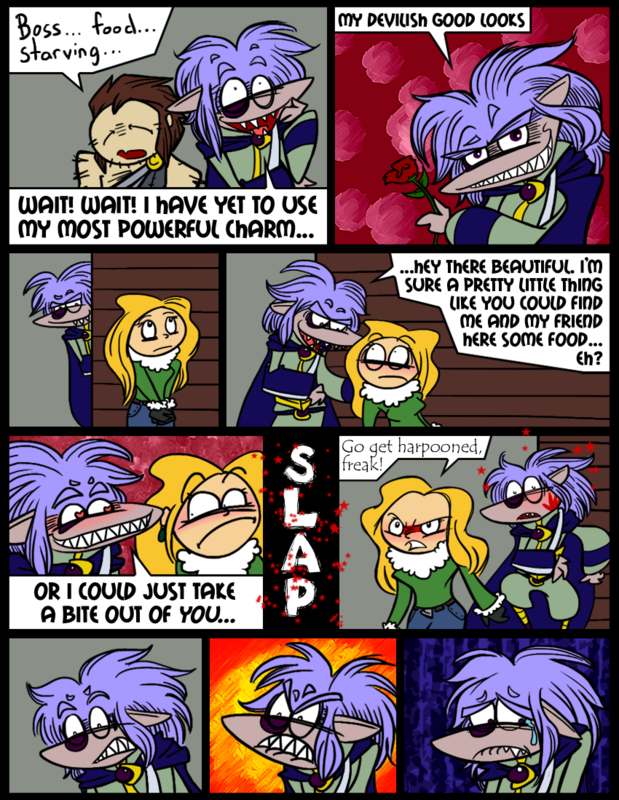 The fact that Derk is not visible in the fourth panel makes one question what “friend” he is talking about. The I’MMA CHARGIN MAH LAZORS one? Also, I don’t know if you’re the only person who has gotten the pun in the name Idenau, but you’re the only one who’s shown it. Fun fact: we had a really hard time coming up with a name for the kingdom. So much for “Most Wanted Man in Idenau”! Oh! Burn! I actually wanted to use a similar joke but we couldn’t really fit it in (…this time). I also tried hard to come up with shark-related pickup lines but it was more difficult than I had foreseen. I just realized, HE HAS 4 EYE BROWS!!!! I’m trying to think of something to rival you, but I’m really flakin’ out here. Snowman can compete with your ice-pun prowess, so we must declare you the winter! Icy what you did there,and even I realize this is getting cold,but I just cant stop,my mind iglooed to the idea of ice,but theirs nothing frost,not like there’s a cost! and I except your surrender with a salute to you,though respect is a chilling concept to me. It’s okay, Skärva, your audience loves you!